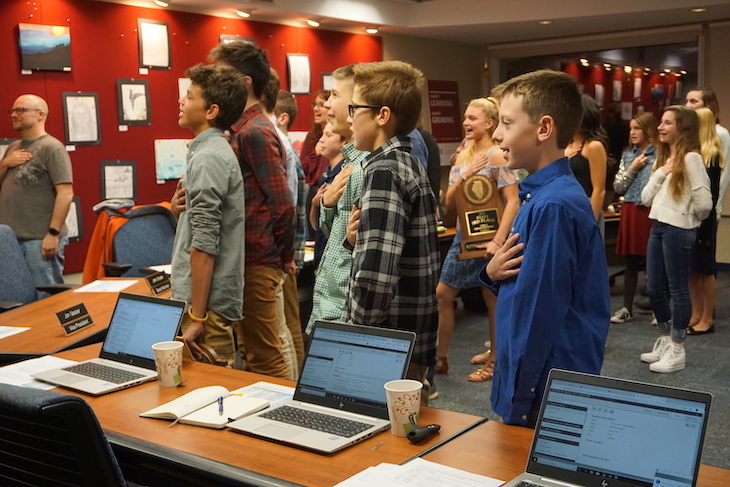 The following is a brief recap of the Tues., Nov. 13, 2018, BPS101 Regular Board Meeting. View the agenda and all supporting documents from this meeting and minutes from previous meetings. 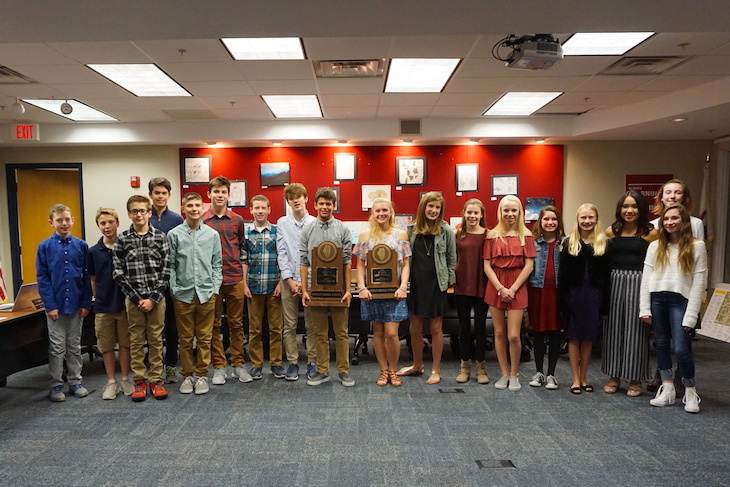 The Rotolo Middle School boys and girls cross country teams were celebrated at the Board Meeting for their undefeated season and outstanding finish at the Class 3A IESA state cross country meet. The boys state team finished first and the girls state team finished third. Three eighth-grade RMS boys finished in the top 10 individual runners, including Quintin Lowe (#2), Anthony Fornelli (#5), and Owen Billie (#9). Ava Thomas, also an eighth-grader, finished #16 in the state for girls. Congrats to all of these student athletes! In accordance with BOE Policy 6:170, Chief Academic Officer Dr. Brad Newkirk presented the Board with an annual monitoring report on Title 1 programs. Title I status is based up on the percentage of low-income enrollment at each building. For the 2017-2018 school year, five of BPS101’s eight schools were identified as qualifying for Title I funding, including H.C. Storm, Hoover-Wood, J.B. Nelson, Louise White, and Rotolo Middle School. Every year, the State of Illinois publishes school and district report cards, which can be found at https://illinoisreportcard.com and under “About” menu at BPS101.net. This searchable reporting system allows the public to examine multiple points of information about our schools and the District. Dr. Newkirk shared highlights from the 2018 school report cards, including designations assigned to schools based on the Every Student Succeeds Act (ESSA). In alignment with the Postsecondary and Workforce Readiness (PWR) Act signed into law in 2016, BPS101 has been working toward the development of a uniform, cooperative system to prepare high school students for college and careers. The goal is to break down barriers to post secondary readiness and success. At the Nov. 13 Board Meeting, Chief Academic Officer Dr. Brad Newkirk said key barriers include college placement in non-credit bearing classes and lack of understanding of careers and the pathways to these careers. Dr. Newkirk shared two initiatives to alleviate these barriers: transitional math and English courses at Batavia High School and the Illinois PaCE (Post Secondary Career Expectations) program. Through transitional math and English courses at Batavia High School, students who may not be on a path to take courses such as calculus, pre-calculus, statistics, AP literature & composition, dual-credit composition, etc., can still enter Waubonsee Community College at a 101 level in math and English and avoid remedial coursework. Transition to college mathematics is currently offered at BHS. Transitional English curriculum is in development. Through PaCE, the goal for each BPS101 student is to have—starting in middle school—an individualized learning plan to help make decisions about career and post secondary education and training, to plan a course of study, and to make financial aid assessments with family members. Dr. Newkirk explained that one of the tools we can use to help facilitate this process is the existing Naviance system, which students currently use at the high school level. BPS101 Superintendent Dr. Lisa Hichens reviewed the Facilities Committee’s next-step recommendations for the Board, which include determining a plan to remediate the unsatisfactory areas determined by the committee. These areas are beyond the capacity and resources of existing budgets and teams. The Board approved an increase in the daily rate for all substitutes from $84 per day to $95 per day, and to eliminate the $92 loyalty rate after the first 30 days. This goes into effect on January 1, 2019. BPS101 Chief Human Officer Steve Pearce explained that BPS101 has not made a change in substitute pay in 14 years and that BPS101 is the lowest-paying district for substitutes in the area. He noted that the BPS101’s low rate is making it more and more difficult to find substitutes in the midst of an overall substitute shortage in the state of Illinois. The Board conditionally approved the Batavia Education Association’s (BEA) Retirement Incentive Plan, pending review by the Board’s attorney and the Illinois Teachers Retirement System. The retirement incentive is designed to provide modest salary increases and a post-retirement lump sum payment to long-serving teachers if they retire in the first year in which they become eligible for a non-discounted annuity from Illinois Teachers Retirement System. The Board would recognize a cost savings in the first year after a teacher retires. Through mutual agreement of the Board and BEA, this retirement incentive plan would be incorporated into the current collective bargaining agreement through a memorandum of agreement. Tues., Jan. 15, 7 p.m.